Sheet Size: 8.50" x 11"
Preserve your award certificates and documents with these certificate document covers. Heavy linen cover stock features an elegant gold-foil design. Reinforced, four die-cut slots on back cover securely hold certificates and documents in place. Documents can be placed in the vertical or horizontal position. 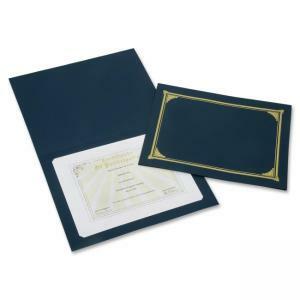 Covers are designed to fit 8-1/2" x 11", 8" x 10" and A4-size certificates or documents. $25C-line Stitched Plastic Shop Ticket Holder - 8.5" x 11"
$18C-line Stitched Plastic Shop Ticket Holder - 4" x 6"
$62C-line Vinyl Seal Shop Ticket Holder - 8.5" x 11"